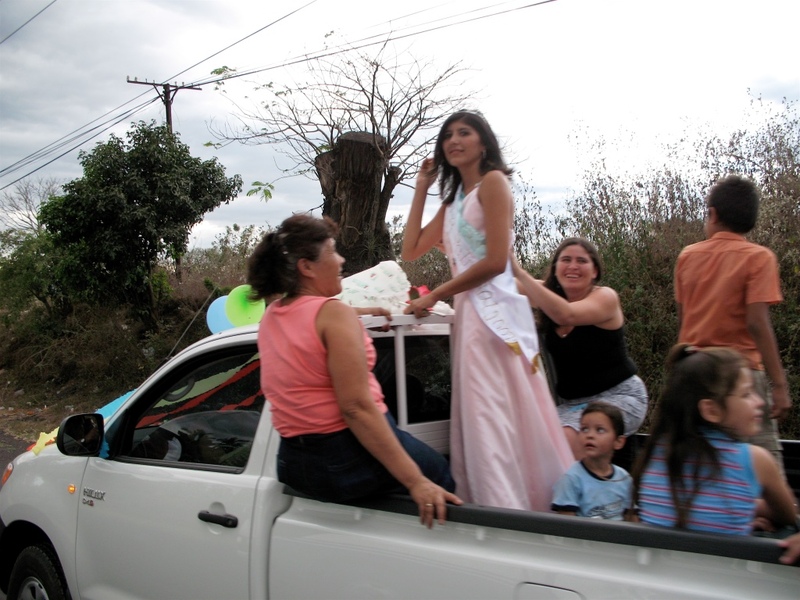 El Salvador is a place where flamboyantly dressed beauty queens and Jesus Christ ride together in the same flotilla on the parade routes. Salvadorans of all walks of life love to celebrate. Most towns having a patron saint who is honored on a specific day of the year, provides a natural reason to fiesta. Quite by accident we stumbled upon one such celebration on St. Louis Day in a small local community. The tradition is for an eleven-day, all out party. During that period of time banks, the mayor’s office and other civic offices close. We seem to be in the midst of the staging area for the opening day ceremony. 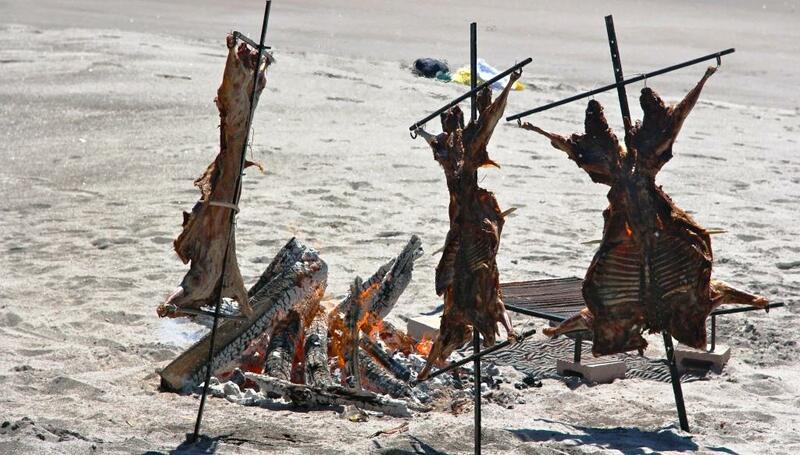 As some are sawing wood, four racks of stretched goat carcasses appear for roasting. Dozens of teenage girls wearing blue shirts find a secluded area to begin taking turns primping by doing each others’ hair and make-up. They are local beauty queens from neighboring communities who have converged here carrying 6”-8” silver metallic high heels in one hand and plastic bags holding their gowns draped over the other. Each gown is the same design but of a different color. The form-fitting bodice matches the silver shoes, but the skirts are layers of brightly colored ruffles. Once these girls are dressed and reach the town center, a formal coronation will take place. They will receive their tiaras and join their courts to ride the floats. Trucks for the float are all decorated and awaiting the pageantry. The trucks are totally disguised from their everyday utilitarian use of hauling families and goods around the community. Many bands, some up to fifteen pieces, play many types of popular Latin types of music entertaining ‘til as late as 4 AM we are told. Because of a history of unruly crowds and some violence during these extended eleven-day celebrations, some communities have gone to an every other day schedule. 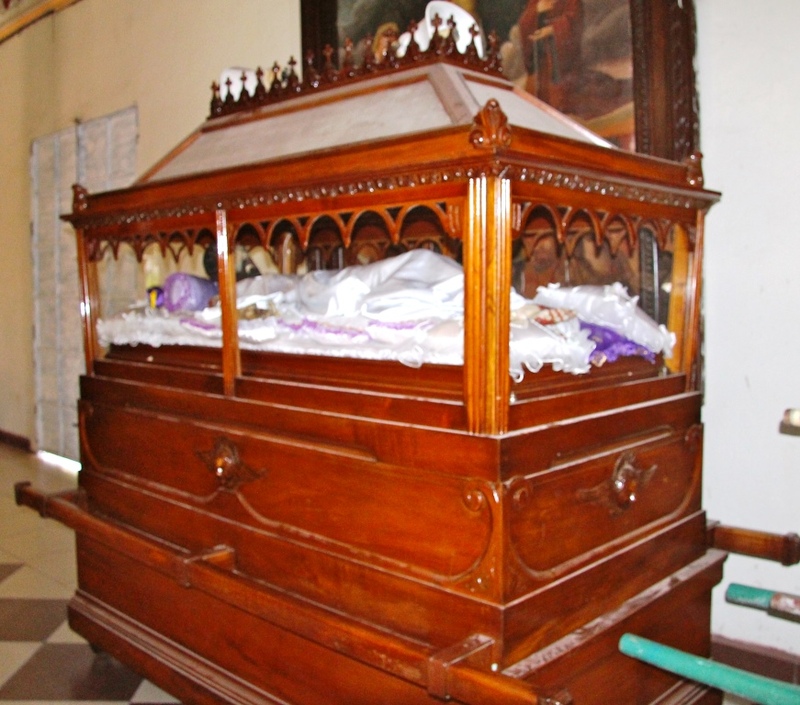 On the final day of the fiesta, candlelight vigils around the churches are held. Enter Jesus Christ. His statue lies in a glass case on a pall, and yes, he too is included in the parade. Fluorescent electric tubes are installed in the case to allow everyone to see him easily. A friend shares the story of receiving a panicked call one day. “We need you to drive Jesus Christ NOW!” The parade was to begin and they lost electricity in Christ’s glass crypt. She drove her truck behind him at 2 mph with an extension cord plugged into the casket to save the day. Even Jesus Christ needs earthly “salvation” on occasion.